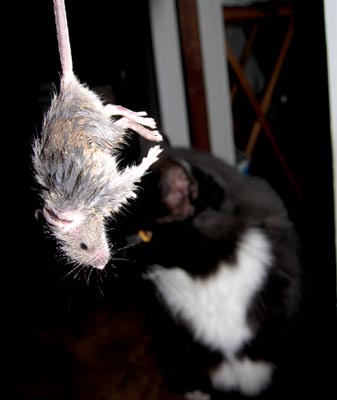 My cat is a good mouser, but why does she have to bring them into the house alive? I subdued the mouse and it met a spiral watery death. I’ve developed a technique when rodents like this, or wasps or nasty lizards get in the house that needs to be eliminated or taken outside. I don’t use bug spray, too messy. Wasps flying around in nooks and crannies of the windows are impossible to hit with a swatter or Thwacker™ which can cause damage to the house. What I use is a can of Dust-Off. If you hold the Dust-Off can upside-down it shoots super-duper cold propellent out of the nozzle that freezes stuff on contact. So I used that on the mouse to freeze it and have done the same to wasps and lizards. Actually I usually toss the lizard outside where it warms-up, comes back to life and runs somewhere else if you don’t freeze it too much. I mean, do you really want to be spraying Raid™ in your kitchen where you cook? Better to use the Dust-Off. It’s like being Mr. Freeze in Batman! Buy the Dust-Off in three packs at Costco and you’re all set.